Ask Unclutterer: How do you move past a fear of regret when purging clutter? My question is, how do I deal with regret? Most people seem able to accept that what’s done is done and move on with their lives, but mistakes I’ve made in the past haunt me for years and I don’t know how to get over them. Do you have any advice? How would I behave if I were not afraid? Would I buy it again if my home burned down? The first question allows you to play through every possible horrible scenario. Nine times out of 10, the worst that can happen isn’t actually horrible. A common response is that you might have to borrow a similar item from a friend, which is a little inconvenient but not horrible. Obviously, if your life might be at risk if you got rid of something (like heart medication or a cane that helps you walk), don’t get rid of that item. The second question gets you thinking about how you will respond to even the horrible scenarios. You can figure out how you would deal with these events if you weren’t afraid of regret or making a mistake. Once you know how Fearless You would behave, Fearful You can feel comfortable behaving in the same way. The third question keeps your perspective in check. 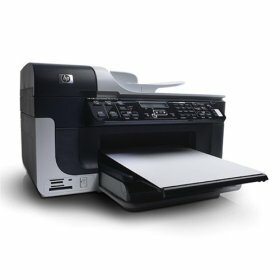 If you wouldn’t pay money for the item now, you likely wouldn’t regret getting rid of something. However, if you would spend money to repurchase the handmade quilt your grandmother made you, it’s probably best not to get rid of that quilt. I’d certainly pay money to repurchase my laptop, so it’s not something I would purge. However, I wouldn’t buy an empty yogurt tub if it didn’t have yogurt in it, so into the recycling bin that yogurt tub will go when I’m finished eating the yogurt in it. Once you know the answers to these questions, you can feel comfortable getting rid of an item if that is the right course of action for that item. A good rule of thumb is to take care of the things that matter to you (the possessions that you’re using and/or that you treasure, like that handmade quilt) and to get rid of the things that don’t matter to you. Owning things require space for storage, as well as money and time to maintain and manage those items. The fewer things you own, the fewer things you have to clean and store and keep track of and worry about protecting. If these three questions aren’t helpful for you and fear continues to paralyze you from taking action, I recommend talking with a licensed medical professional about your anxiety. Getting rid of clutter should feel liberating, not debilitating, and a psychologist can help you if there is more going on than just dealing with your stuff. Thank you, Oh My, for submitting your question for our Ask Unclutterer column. Be sure to check the comments for even more advice from our readers. The windows in this Australian office are downright blissful. To be honest, the office could be outfitted with a card table and a broken chair and I’d have still likely featured it. However, it is much more than pretty windows, it is a wonderfully streamlined desk and office space that would make work very simple to complete. The monitor is on a telescoping arm that makes adjusting it and pushing it back off the desk space possible. All of the equipment needed on a daily basis is within immediate reach and nothing else appears to be cluttering up the work surface. 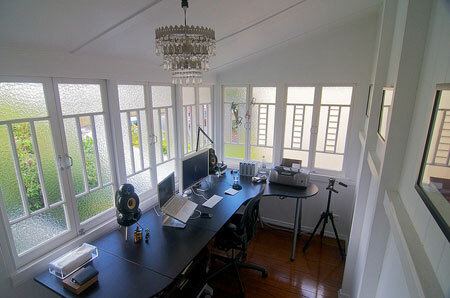 When summer heads to the southern hemisphere, I would love to see an image of those windows open — I imagine it has to be a glorious space to work then, too. I plan to teach my son how to tie his shoes the same way my parents taught me: 1. Buy him laced shoes, 2. Demonstrate how to tie his laces 3. Let him practice, 4. Guide him if he needs some additional assistance, and 5. Be happy for him when he figures out how to tie his own shoes. The Tie-Up Wooden Shoe can’t be worn. It’s just a training device that becomes clutter the second your child figures out how to tie shoes. Instead of a fake wooden shoe, I suggest buying your kid a real pair of laced shoes and let him practice on the shoes he’ll eventually be tying on his own and wearing. If he wants to practice on a larger shoe, simply let him borrow one of your shoes to use for practice. 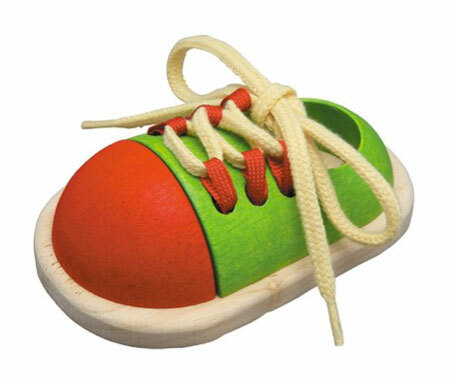 Although cute and clown-like, the Tie-Up Wooden Shoe doesn’t do anything a real shoe can’t do. Thanks to reader JR for finding this adorable unitasker for us, and for helping us stay on the “tie” theme from last week. For example, I’m allergic to Neosporin, yet I found six tubes of it when we were packing up for our move. I had regularly looked at those tubes in different parts of our house over the years — the medicine chest, the emergency kit in the kitchen, the medical kit in my gym bag — yet I didn’t get rid of them whenever I saw them and thought, “I should get rid of those.” I’m also not very sure how we came to own the ointment. My best guess is that my husband brought a couple into the house, maybe one or two came with a packaged medical kit, and one could have been left here by someone else. In the case of the Neosporin, and all clutter, I believe Newton’s First Law of Motion can explain how it lingers for years in our spaces. An object (clutter) will stay at rest until a force (motivation) of equal or greater value acts upon it. The thought, “I should get rid of that,” is not a force of equal or greater value than the clutter. As unfortunate as it is, thoughts cannot move clutter. We can’t wish away our unwanted objects. We actually have to do something about them physically. The other case of Newton’s First Law also applies here. An object (me) will continue in motion until a force (motivation) of equal or greater value acts upon it. Usually when I would see the Neosporin, it would be because someone or myself was injured. I was on a path to take care of the injury, not stop and deal with clutter. Then later, when maybe I thought about the Neosporin again, I could have been on a path to a meeting or to make dinner or to relax and watch a movie with my family. The motivation to clear the clutter wasn’t equal or greater than whatever else it was I wanted to be doing. The only way to deal with the clutter in our lives is to break the patterns of inertia and muster up the motivation to do something about all the stuff we don’t want or need. Surprisingly, the best way to create force (motivation) of equal or greater value to change the course of our clutter is to simply acknowledge that we have the power (velocity) to change the situation. After we think, “I should get rid of that,” the next thought should immediately be, “and to get rid of it I have to take action, now.” Then, take the action to get rid of the object. (Unless, of course, you’re dealing with an emergency. Deal with the emergency and then come back when you’re on a path to watch television or something equally benign.) Knowing that the object will not move itself and requires a force to act upon it can go a long way in helping you to clear the clutter you encounter regularly in your life. It can be helpful to have five boxes in your laundry room or at the base of your closet when you’re just getting started on this process. Have one box for items to be returned to other people, a second box for items you wish to sell or Freecycle, the third box for charitable donations, the fourth should be a trash can, and the fifth box a recycling bin. When you come across a piece of clutter, pick it up and carry it to the closet. Decide which of the boxes is most appropriate for the piece of clutter, and then go back to whatever you were doing. When one of the boxes is full, deal with the items in all of the boxes. Take out the trash and recycling, drop off items to charity and to friends, and list the items you wish to sell or Freecycle. Holy orderly, Batman! 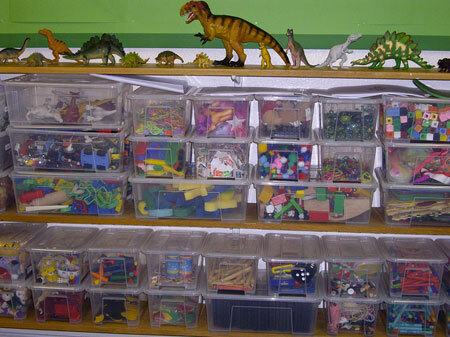 Emu582’s use of clear plastic storage bins in the classroom play area and on the resource shelves is impressive. 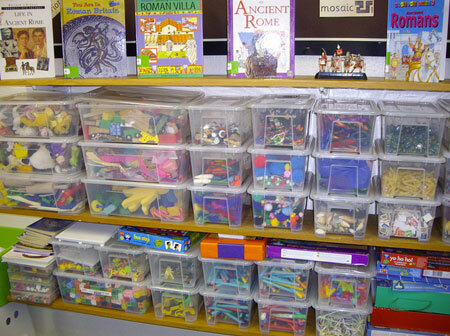 Students and teacher can see what is inside each box, so retrieval is simple. Thank you, Emu582, for submitting these amazing images to our Flickr pool. I have many super powers (e.g. I can grab poison ivy with my bare hands and not have a reaction), but my kryptonite are balloons. For starters, I’m allergic to latex, so touching them causes me to break out in a rash. Secondly, the squeaking sound they make when you rub your finger across them drives me batty. Thirdly, tying them off is tedious. And finally, the anticipation of someone about to pop a balloon makes me incredibly anxious. Unless you’re a professional water balloon maker, I’m not really sure the average person needs the Tie-Not. For those rare times you decide to throw a water balloon party (are there such things? ), I’m certain you can handle the stress of tying the balloons. Also, having to tie all those balloons might give you pause to throwing a water balloon party in the future. 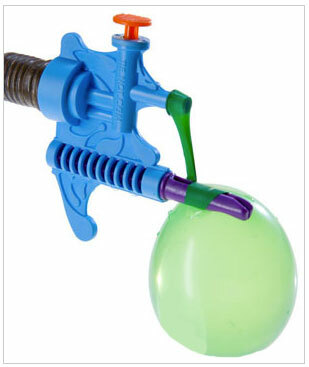 Because, really, who enjoys being smacked with a water balloon? Sure, it’s fun to clobber other people, but getting hit by one is never a joy. Water balloon attacks always end with someone getting a pitcher of water and just pouring the water on their competitors — so why not start with those? Pitchers are also reusable. And don’t hurt. And don’t leave little balloon particles in your yard. And don’t cause rashes. And aren’t balloons. To close, I feel the need to point out that the name of the product is “Tie-Not.” In my understanding of the English language, the word NOT implies the negative. In this case, it would mean that the device doesn’t tie. I think this is brilliantly absurd, and commend the makers of the Tie-Not for not false advertising (check out the 1-star reviews on Amazon for examples of the device not working). Thanks to reader Steph for introducing us to this soggy, summer unitasker. Reusing objects is a tricky matter for people, like myself, who struggle with clutter. Our initial instinct is to save an item so we can reuse it (I’m being frugal! I’m helping the environment!). However, if the object is never repurposed, it becomes clutter. The most common examples of this are plastic tubs for food stuffs like cottage cheese, sour cream, and margarine. We save the tubs thinking we’ll reuse them to send leftovers home with dinner guests. And, there may be one or two times in our lives when a tub is used for such a situation, but mostly these tubs make a mess of a kitchen drawer or cabinet for years or even decades. I’m thoroughly impressed by people who save items planning to reuse them, and then actually reuse the item creatively and within a reasonable amount of time. When done in this manner, reuse can be a wonderfully uncluttered, frugal, and environmentally friendly way to live. 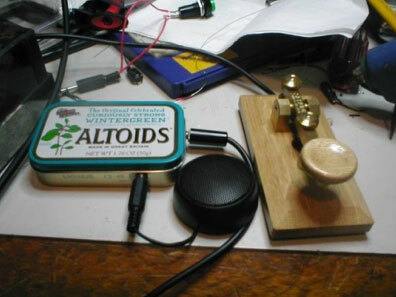 If Altoids tins aren’t filling up your drawers, maybe you are looking for a way to turn a cigar box into a guitar or wanting to find another purpose for those margarine tubs? 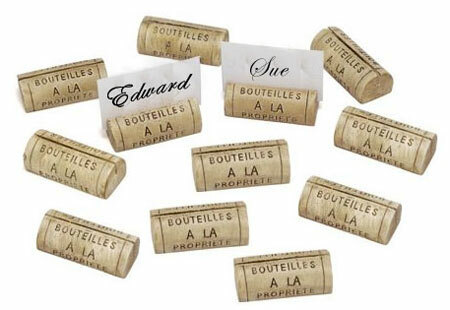 Old coffee cans have numerous uses and so do used corks. Don’t let maybe-one-day items clutter up your space. Either drop them in the recycling bin right now, or get started on a reuse project that will keep the item from being clutter in your home. Being organized can make a positive impact when giving a speech. If you’re disorganized and ill-prepared, your audience is likely to not pay attention and get very little from the information you provide. Conversely, a well-practiced and orderly speech will keep your audience interested and leave your audience members glad they took the time to hear your insights. You need to be providing an average of one piece of information (or more) for every minute of your speech for your audience to believe that you were worth their time. Think of really good stand-up comics — they are amazing at what they do and they deliver punch lines every 10 to 15 seconds. (Time a Jim Gaffigan routine and you’ll see what I mean. He averages a laugh almost every six seconds.) In a 30 minute speech, you’ll likely only get in 30 memorable pieces of information. At all points while you’re drafting your speech, consider your audience. You’re not trying to impress them, you’re there to help them. You’re a teacher, not a promoter. Think about what your audience will want to know, and then think of the best way to transfer these 30, 45, or 60 pieces of information. Provide examples, real world situations where they can use the knowledge you’re giving them. Although you’ll be nervous, the speech has very little to do with you and everything to do with the audience. Once you know what your audience wishes to learn and what points you want to teach them, organize the information in a way that makes learning the information easiest. You don’t have to be funny or the best speaker the audience has ever encountered, you just have to help them to learn information to the very best of your abilities. When you draft what you want to say, don’t write it out word for word. Outline the important points (those 30, 45, or 60 points mentioned previously) you wish to cover, your introduction and your conclusion, but stop there. If you write it out completely, you’ll sound like you’re reciting a speech instead of having a conversation with your audience. Bring an outline of your speech with you to set on a table or rest on the podium. If you’ve practiced sufficiently, you won’t need it, but you’ll feel more comfortable with it being there. Plus, if you actually forget, you won’t let down your audience because you’ll have it there. When most people are nervous, they will want to talk faster than they usually do. Fight this instinct with all your might. Either that, or prepare 35 minutes worth of content for a 30 minute speech. If you don’t speed up when you’re nervous, disregard this item. Practice, practice, practice. Give the talk to your spouse or a close friend. Give the talk to a video camera. You’ll feel more awkward giving the speech to someone you know well and a video camera than you will to a room full of strangers. If you can get to a point in your practice where you feel okay with giving the speech to your someone you’re close to and a video camera, you’ll rock it when it’s time to give the real presentation. Get out from behind the podium and make eye contact with your audience. Again, since your goal is to educate your audience, you want to be able to see their faces and make certain that they’re understanding what you’re trying to teach them. If you are not accustom to speaking publicly, identify at the beginning of your speech that you’ll be taking questions at the end of your speech. This way, you won’t get off track. Then, leave enough time at the end of your speech for questions. When answering questions at the end of your speech, rephrase questions at the beginning of your answer in case not everyone in the audience could hear the question (“Bob is wanting to know if X is the reason Y exists.”). You may be the only person in the room with access to a microphone. Be sincere. Don’t put into a speech information that you don’t know backward and forward. Knowing the topic extremely well will help reduce your fears because you’re already comfortable speaking about the subject. When there are questions at the end of your speech, you want to make sure that you’ll know the answer. Again, you’re there to teach. During your conclusion, let people know how they can get into touch with you after your speech. There will be additional questions and they might not develop until a few days after the audience has had time to sit with what you’ve told them. Also at the end of your speech, thank people for choosing to come and listen to you. Even if people don’t feel like they learned a lot in your presentation, they will remember you as someone who wanted to help and was generous. This positive attitude typically leads to more speaking gigs. As long as you are a well-rehearsed authentic educator, it will be easy for you to stay organized throughout your presentation and deliver a valuable speech for your audience.